The Australian lobsters and crayfish belong to a group called the Palinura. They characteristically lack the large, powerful claws that are the hallmark of freshwater crayfish, and the classic-looking northern hemisphere marine 'clawed' lobsters. 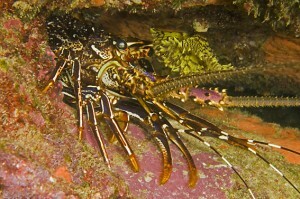 The two most common families are the spiny lobsters (Palinuridae), and slipper lobsters (Scyllaridae). The Moreton Bay Bugs and Smooth Fan Lobsters are both commercially fished. An ancient group, their fossil history stretches back to the Lower Triassic (about 150-200 million years ago). Moreton Bay Bug (Thenus parindicus) Coral Crayfish (Panulirus longipes bispinosus): Eastern Australia to Southern NSW; also Western Pacific.